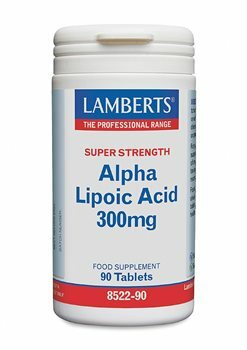 Alpha Lipoic Acid - 250mg (also known as thioctic acid). Calcium Carbonate, Alpha Lipoic Acid, Cellulose, Tablet Coating (Hydroxypropyl Methylcellulose, Glycerin), Silicon Dioxide, Stearic Acid, Magnesium Stearate. Those suffering from diabetes should consult a doctor prior to taking alpha lipoic acid as it may enhance insulin activity.